Take 15% OFF your entire purchase! Use DISCOUNT CODE BF14 at the checkout and SAVE BIG!! Happy Holidays from the Licks Crew. Black Friday SALE is coming at Licks! Wondering what to get your biker this Christmas? Perhaps a sweet 3/4 NovDot helmet, or the new Justa Z handlebar, maybe even a coveted handmade solo bag from the Licks Elves! Yes .. Saint Nick is toating custom parts from Licks Cycles this year! 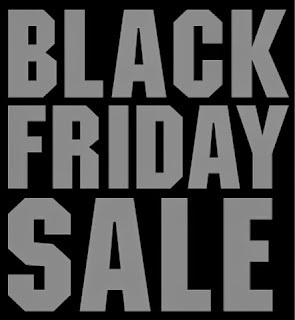 Keep a close watch out for holiday deals on some of the hottest products around... We are currently running deals of the day that can be located on the homepage of the website and Black Friday deals are on the way!!! Not sure what buy.. No problem! We have gift certificates available now!! We are continually looking to improve our service and offer added value to our loyal customers. As everyone knows, a buck doesn't go as far as it use to. As such, we would like to announce that from this point forward, we are implementing a running "Deal of the Day!" The deals can be found by accessing the "Deal of the Day" link at the top of the page or by clicking the tile banner on the home page. We are going to offer a variety of our best products at significant discounts to you!! You will have to check back frequently because the deals will only last for short periods of time, no more than a day and perhaps only a few hours!! All riders would agree that eyesight is a critical component of riding a motorcycle. So why wouldn’t you protect your eyes? Wearing a pair of motorcycle glasses or goggles isn’t just a matter of comfort and looking like a stud. It’s a matter of protecting the delicate ocular orbs that make riding possible. Let’s consider what could happen if you choose to forgo motorcycle riding glasses or a full face helmet. Discomfort – Wind, sun, exhaust fumes – all of these elements lead to severely dry eyes. Rapid evaporation of moisture causes this uncomfortable condition, which can blur vision. Motorcycle glasses shield the eyes, and motorcycle goggles are even better at locking in moisture so it isn’t lost. Injury – In this scenario, you’re driving down the road behind a truck with meaty wheels doubled up in the back. You’re just driving along minding your own business when all of a sudden – WHAM! That tiny rock that would have cracked the windshield of a car just took your eye out instead. Inability to Drive – The biggest problem is that if anything along the lines of the scenarios above occurs, it will impair your ability to safely drive. That’s not only dangerous for you, it’s dangerous for other drivers who may become involved in an accident if you lose control or wipe out. Long story short, find yourself a slick looking pair of motorcycle riding glasses so that you can enjoy the ride instead of worrying about losing an eye. Specialists like Dr. Sharon Kleyne agree that motorcycle eyewear is one of the best ways to avoid dry eye and injury. Here’s a look at the top options. Motorcycle Glasses – Chances are, you have a few pairs of sunglasses at home, which is better than nothing. But, it’s worth investing in motorcycle glasses that are designed to be worn while riding. They have a snug fit, are aerodynamic, and are made of a non-shatter material like polycarbonate. 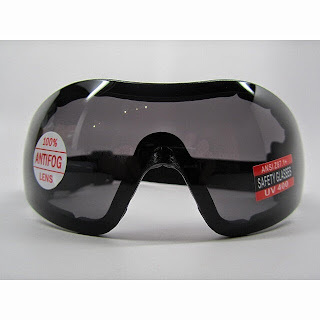 Motorcycle Goggles – Motorcycle riding goggles offer slightly more protection than glasses since they wrap around the head and won’t come off. Goggles also completely cover the eyes so no wind will dry out the eyes. The one thing to be careful of with goggles is comfort. The motorcycle goggles for sale at Lick’s Cycles are designed to fully protect peepers, but have vented foam lining for comfort. Helmet Shields – These aren’t technically eyewear, but they are protective helmet accessories that are meant to shield your eyes while you’re riding if you don’t have a full face helmet. They easily hook onto helmets and can either be fixed in place or flip up and down. You can also pair sunglasses with a helmet shield for added protection. If all this hasn’t convinced you to shield your eyes, maybe to cool factor of Lick’s Cycles motorcycle goggles and glasses will. We’ve got numerous styles to choose from, all of which provide superior protection while you’re on the road. Safety, style, and comfort are three things that every motorcycle rider has in mind when selecting a helmet. For those who want the most protection with the least amount of coverage, NovDot Mini half shell helmets won’t disappoint. 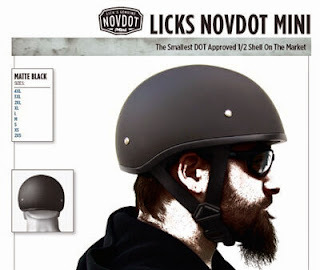 Lick’s Cycles used their insanely popular ¾ NovDot helmet as the basis for the design. The company spent a year working on the new helmet and figuring out a way to cut the size down without sacrificing the DOT standards. The effort paid off in the end with the creation of the NovDot Mini, which looks just as good as it feels. It boasts the lightest, smallest shell of all the DOT half helmets on the market today. NovDot Mini half motorcycle helmets also come in a huge range of sizes so that all riders and passengers can get the best fit possible. Being able to select from nine size options is one of the major reasons this helmet feels and looks so good. About the Author: Lick’s Cycles sells custom motorcycle accessories including helmets in their online store. Visit www.lickscycles.com today to view their product selection. Drive farther, longer, and more confidently with the Commander II Michelin motorcycle tires for Dynas and Softail Harley Davidsons. Commander II tires are designed specifically for cruisers, taking into account all of the handling concerns that come with these types of motorcycles and how they’re ridden. The Michelin Man has long been the king of tire production in America for over 107 years. From the first cars to today’s fastest motorcycles, the company has kept people moving down the road. Michelin is known for being an innovator in the industry, leading the way in the latest concepts, technology, and designs. The Commander II Dyna and Softail motorcycle tires are a perfect example of this commitment to excellence and top performance. Let’s be honest. One of the first things people consider when buying tires is how long they’ll last. Tires are a serious investment, and every mile you get out of them gives you more for your money. One of the biggest draws of the Commander II Michelin tires for Softail motorcycles and Dynas is that they reportedly get almost twice the amount of mileage compared to the competition. Riders have also noted that even after thousands of miles, the Michelin Commander II tires show little signs of wear and tread reduction. Speaking of the tread, this is a part of the tire that affects both performance and appearance. Serious riders understand how tread construction and patterns can every aspect of the tire quality. Michelin put a fair amount of thought into developing the Commander II’s aramid tread plies so that the rear tire provides better stability and resists centrifugal growth. The tread pattern is also designed to help with handling on wet roads by evacuating water more effectively. The quality of the rubber that meets the road greatly affects the handling of the bike and smoothness of the ride. Commander II Softail and Dyna motorcycle tires utilize what Michelin calls Amplified Density Technology. It’s an architecture that creates a tire casing with higher density and rigidity that results in smoother, more even feedback. The tires have also been rated for speeds of up to 149 miles per hour for riders who like to take faster cruises every now and then. In addition to using construction techniques like Amplified Density Technology, Michelin has also carefully selected the compounds used to create Commander II tires. Usually, amazing durability means you have to sacrifice grip and handling. Michelin has developed a new rubber compound that improves wet grip without affecting the integrity or longevity of the tire. Square bead wire packaging is also used to improve rigidity and handling. 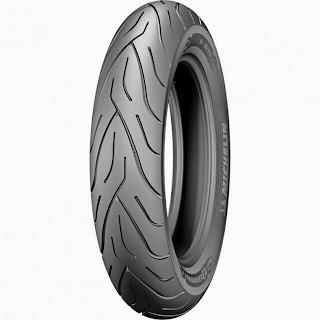 If you’re interested in the Commander II Michelin motorcycle tires for Dynas, Softails and other cruisers, you can check them out at Lick’s Cycles. The stock includes various sizes of front and rear tires for the perfect look and fit. Visit their online store at www.lickscycles.com. Carrying your stuff with you is often easier said than done if you’re a rider, particularly if you wish to maintain your style. Bulky storage compartments found on many cruisers are for cops and others who care little about style points, but not for you. Aside from the pure joy of riding, you bought your Sportster because it looks good, and because it makes you look good. Still, you may need to carry some stuff. What do you do? 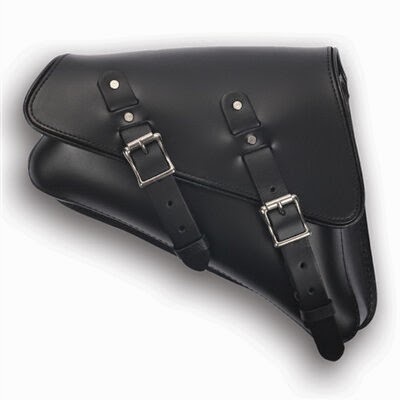 Enter Lick’s Solo Bag, specifically designed to fit rubber mount Sportster models 2004-present. Keep in mind, this is one of our best selling items, and because we build our Harley solo bags by hand, there is some turnaround time, so order yours now! 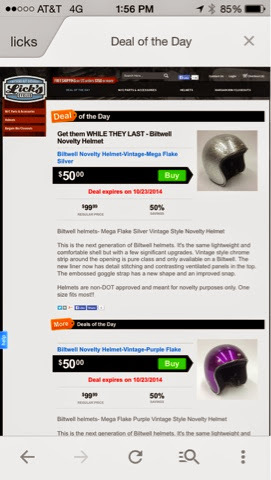 Licks cycles new "deal of the day"